Travelling by bus to the airport can be far cheaper than taking the train or the taxi. True. However, the GoOpti transfer can cost the same (or even less!) if booked in advance. Thanks to the smart technology that optimizes space in the vans, you can obtain a premium price which includes all the expenses of the ride. 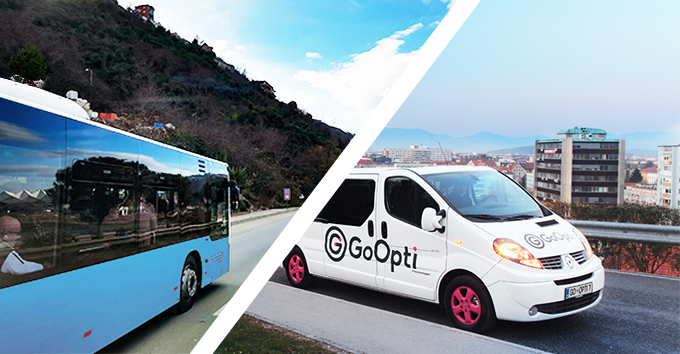 Check out our 4 advices to book an extra cheap GoOpti transfer. It is very unlikely for a bus to be canceled and the companies know their routes well enough that significant delays are rare. True. However, did you know that GoOpti will deliver the transfer even if there is only one person on board? Furthermore, GoOpti has developed a unique program called Absolutely No Worries package, which gives you complete peace of mind. For as little as 3 euros (the price depends on the transfer) you get the guarantee that if something goes wrong on the road (traffic jams, unexpected delays …), GoOpti will find and buy you another plane ticket! Buses have for sure upgraded their amenities. They are spacious, modern and air-conditioned. Some of them also have wi-fi. However, a GoOpti van offers you even greater comfort. Impeccably clean vans for 8 people and a professional driver. You won’t even miss wi-fi as you will reach the airport in no time. And the best thing is that GoOpti offers you the option to pick you up at your home address or drop you off wherever you require (hotel, home, grandma’s house …). And yes, at the price of the bus ticket! Buses have standard routes that sometimes bypass smaller suburban areas. They also have fixed schedules. In terms of routes and time, buses cannot be flexible because they are designed for larger groups. GoOpti on the other hand is the synonym for flexibility. It is designed to adapt to your needs, even if this means picking you up in a small village at 3 a.m. Traveling by bus can be quite a jolly ride as you are accompanied by a larger group of people, sometimes with quite varying views on comfort (temperature, music, smelly food, etc.) In GoOpti minivans for 8 people it is much easier to travel according to your taste. A friendly and professional driver takes very good care of you, immediately addressing all your requests to make sure you experience a pleasant journey. Travelling by bus can be an amazing experience for those who opt for the slow style of travelling. But when it comes to choosing the best mean of transport to reach the airport, then GoOpti is by far your best option.